Today’s dressgasm was another eBay find from a few days ago. I found this dress rather interesting because of the two different bodices that were made to give the dress distinct looks. Multiple bodices used to go from day to night were fairly common throughout the nineteenth century but surviving examples of entire ensembles still together are not as common anymore. I can’t remember everything the eBay auction said but it appears to me that this dress is made of silk, probably silk taffeta, which was a common luxury fabric in the nineteenth century. The color is a lovely icy violet with white highlights and trim. The eBay auction said that this dress was a wedding dress. Most certainly, the bride wore the high necked, long sleeved bodice on her wedding day. 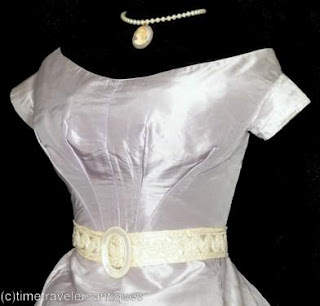 As to not waste a perfectly beautiful dress, she made or had made a ballgown bodice – the short sleeved, wide necked bodice with the white belt – so that she could continue to wear the dress for evening events. 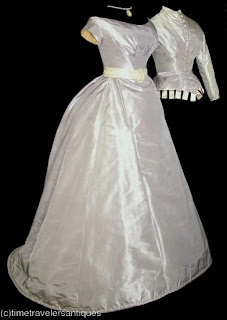 In some cities in the later part of the nineteenth century, it was expected that the bride appear somewhere in her wedding dress within a year of the marriage. Prior to that tradition, most brides reused their wedding dresses repeatedly as church dresses or reworked them as ballgowns or, among poor brides, simply reused them in their everyday lives. 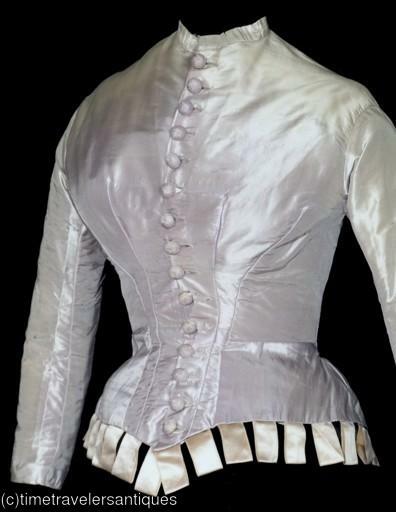 Nothing was to go to waste in the nineteenth century since there were no standard sizes or ready made clothes. Everything was made specific to each person through a great deal of time and effort. If I was this bride, I would certainly want to reuse this dress a lot because of the beautiful color and the flattering way it hugs the figure.